A few months ago we received a complaint from a customer that the ¾” & 1” suction/return lines that they were assembling were not getting as clean as their other hoses. “We have been using your product and it usually works great!” they told us, “But these are the only sizes that don’t pass our gravimetric cleanliness tests.” After trouble shooting a little bit over the phone we then asked him if he knew where the hoses were manufactured. He named the site and we instantly realized what the issue was. The year prior to our customer’s phone call we had the opportunity to visit a hose manufacturer in the Southeastern U.S. that specialized in manufacturing the suction/return hoses that our customer was using. During the tour we noticed that the manufacturer was using an exorbitant amount of mandrel lubricant during the hose fabrication process – far more than even they admitted was necessary. We stressed to them the importance of hose cleanliness and suggested that they reduce the amount of mandrel lubricant in order to cut down on contamination in the lines. But our suggestions for clean hoses were politely declined – it was easier to slab on the lubricant rather than change their process. Mandrel Lubrication: What’s it for? 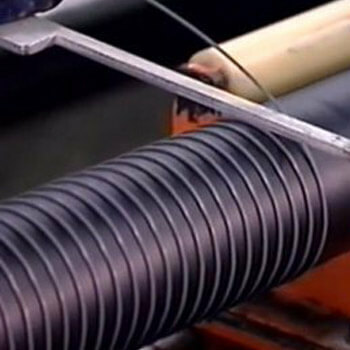 Mandrel lubrication is a necessary part of the hose fabrication process. It allows the hose material to vulcanize and cure without adhering to the mandrel. But it is also the first contaminant introduced to new hoses and one of the most difficult to get rid of. Under normal circumstances our Standard Cleaning Procedures are sufficient to clean a new hose but in the case of this manufacturer with excessive mandrel lubricant residue, a little more care is required to get it clean. Nothing as drastic as a flushing machine! Just some simple alcohol-based solvent or mineral spirits will usually work. 2. Spray the solvent into the tube. You can also dip the projectiles into the solvent itself. Either way, you’ll want to spread the solvent along the inside walls by firing projectiles down the hose. Depending on the amount of contamination present you’ll want to repeat this step several times. After spreading that solvent through the tube you now want to remove it. Resume the normal cleaning procedures using dry projectiles. Fire one from each end before fitting on the couplings and then fire one additional projectile after crimping. After identifying that the hose manufacturer we had visited in the Southeast U.S. was the exact same hose supplier for our customer, we told them about the mandrel lubrication issue that we saw there. “That’s exactly what’s clogging our gravimetric patches!” they told us. After following our suggestions as outlined above, our customer called us back to say that all their assemblies were now passing the gravimetric tests. Distributors today are feeling more and more pressure from their customer base and OEM’s to meet or maintain cleanliness levels. As awareness builds about the effects of contamination on equipment, companies are judging suppliers based on their conformance to cleanliness specs. Providing clean hydraulic assemblies is fast becoming a market differentiator. Hose manufacturers may not be as concerned about cleanliness as a distributor needs to be, but their actions can still affect a distributors’ cleanliness results. Always perform random cleanliness evaluations to ensure that your efforts are getting the best results possible. If you are having difficulty getting clean results give us a call. We can help evaluate your processes and work with you to meet acceptable cleanliness levels.